A new week has come, so it's time for the new weekly Superstar gift. 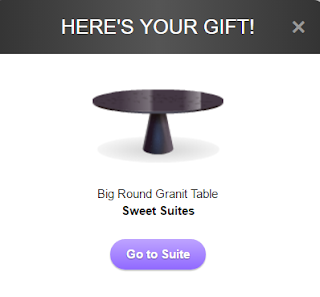 Sweet Suites Big Round Granit Table! It's always good to see some decor items for free. I honestly cannot remember how much this table was in store, but judging from the "Sweet Suites" label, it would definitely cost a lot in store, so consider yourselves lucky, my fellow Stardolls! Anyway, a nice table for free, grab a bargain while stocks last. What are your thoughts on the new gift?